For those of you who went above and beyond the call of duty, I present to you this award! It's not too late for you to get your hands on one of these nifty buttons. 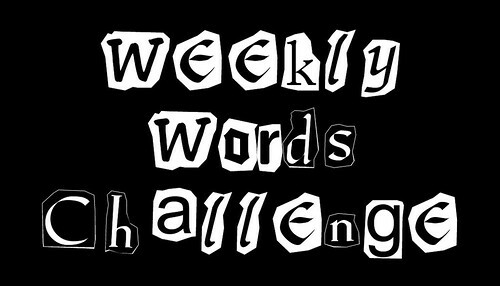 All you have to do is post a picture or pictures for one or both of the April Fools Day WWC words. 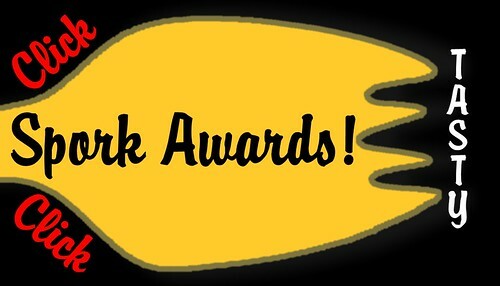 For those who get to take this nerdy spork home with you today, please leave an acceptance speech below. Much love homebloys. Rock out with your spork out. Aw man, that is a COOL award. I would go for it, but since I rarely ever play the wwc, I would feel guilty taking the award. Conratulations to those who won it though! Damn! Makes me wonder why I'm not playing WWC!! I'd like to thank all of the WWC bloggers for inspiring me to do more eacah week, and especially I'd like to thank Tink for her espieglerie. English really was my college major. Four words was just too much brain power for me. BUT I know a certain someone that has been doing some overachieving lately. You can tell by all the other bloggers praising her. I won't mention any names. Congrats to you's that did it!! I don't really know if I did it or not so I'll just nod in appreciation towards the Dilbert spork. Nice work on that Tink. Always did go for the nerds. Oooh... that thing is so hot! I just know it would look good in my Trophy Case! I entered, I hope it counts, I really want a Spork! 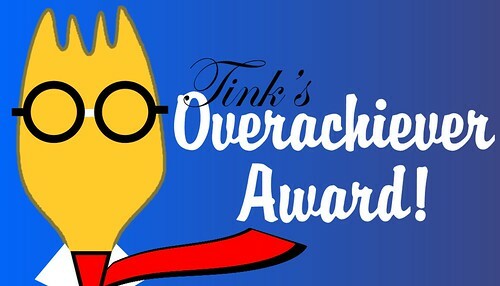 Finally - an award for those of us so literal-minded and trusting that we follow Tink's directions no matter what! I would like to thank all the little people who made this award possible - my little husband, my little friends, my little dogs, My Little Pony - for allowing me to take pictures of them - or for not noticing when I do, which is much the same thing. No false modesty here - I deserve this award! I am literal-minded and trusting! Plus, I am trying to set an example to all other award winners - lesser awards, to be sure - like the Oscars, and the Grammys and the Emmys - but awards nonetheless. Just ONCE I would like to see a winner get up and say "Thanks! I deserve this!" and then GO AWAY. So thank you Tink (I'm tearing up now, just like kcinnova) for this lovely spork. I shall treasure it always, and if I can figure how to turn html code into something solid, it shall have a place of honor on my mantel. Until then, it will have to rest in my computer, because my stupid free "godaddy" blogsite won't let me do buttons. The Wiz is working on getting it on my actual SITE, however, which is under construction. Until then, anyone who wants to see my pictures for the April Fool's words, feel free to drop by, point, and snicker. Spork on! Yes, I admit it, I am an over achiever! I would like to thank Tink for enabling me to show the blogoshpere that side of myself. Anyone who wants to know what the heck that things is in my wwc can drop by later and I will have a post explaining what it is. aw heck. i would love one of those, but i dont play wwc. seems like cheating to do that now just for the awesome blinginess. sigh. i'll just have to be happy in my underachievement. ah, thank you, thank you! I am so overwhelmed ::sob:: ... I have to thank my son and my perfectionistic, teacher's pet nature, for which I would never have tried to bite off more than I can chew. Any other week but this one. It's just been a really, really horrible week. But next time...for sure. I would first like to thank Tink who posted two of the hardest words ever to come up with photographs for - but at the same time it was a whole lot of fun trying to get the brain to come up with perfect pictures. I would also like to thank the Hubster for willingly holding up the monkey shining the flashlight so that I could be an overachiever in the first place. Good blog I had never seen something like that in a blog, I think it's very creative, I'd like to arrive at home and continue posting here, you had an excellent idea. This a great post. i would like to read more about this topic another day, regards. Helpful. Thanks for sharing the information. Excellent thanks a lot for share is very funny. Did you seriously just click that?